INTRO/SUMMARY: It’s often said that ZIP codes matter more than genetic codes in shaping Americans’ health. The problem is, for too long, few healthcare providers actually put what we know into practice – and talked directly to patients about the social barriers that stand in the way of achieving their best health. But now that’s changing. In the era of value-based care, health systems are joining forces with IT and community partners to overcome social barriers that stand in the way of patient health. Central to this effort is integrating questions about social determinants of health directly into electronic health records. Such initiatives are showing that they can transform health outcomes in previously underserved communities. Atrium Health is one of the country’s largest hospital systems and serves several of the country’s most underserved communities across the Southeast. Currently, our hometown of Charlotte ranks last for economic mobility among the top 50 U.S. largest cities. And every day, we see the ongoing health consequences of chronic poverty: uninsured and less affluent patients returning to our offices time and time again with complications of the same chronic health problems – such as diabetes, asthma, and high blood pressure. More often than not, these chronic health problems are caused or exacerbated by social conditions, such as diet, housing, and exercise. Addressing them requires that we think outside the walls of our exam rooms and our faculties and get to know the communities where our patients live, work, play, and age. • Are you worried about losing your housing? • Has lack of transportation kept you from making medical appointments? • Over the past year, has anyone in your family been unable to get food when it was really needed? 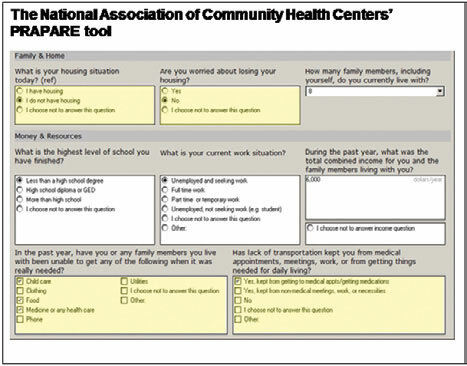 Ultimately, these and other questions developed by the National Association of Community Health Centers are being integrated into the electronic health records of every patient. Currently, we are rolling out the next phase of a pilot program to embed the National Association of Community Health Centers’ PRAPARE tool within Atrium Health’s electronic health records. By integrating questions about social determinants of health directly into electronic health records, patients get the opportunity to talk about how their housing, access to transportation and food, and interpersonal relationships may affect their health. 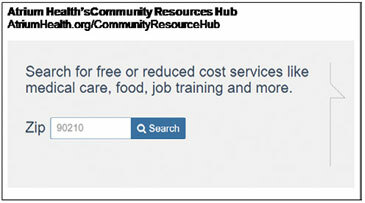 This has allowed robust collection and analysis of data on social determinants of health. As a result, Atrium Health’s population health specialists can pinpoint the most consequential social barriers – and work with community partners to remove them. For example, by comparing patient records with maps of our region, we were able to pinpoint one critical driver of patient health: food insecurity. After seeing this trend, we doubled down on programs with our trusted community partner Loaves and Fishes. 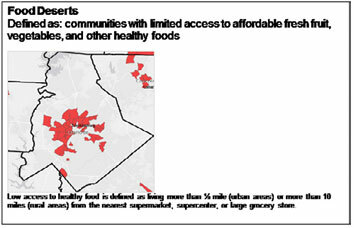 Together, we increased outreach and programs in the “food deserts” that we identified. “Food insecurity is associated with obesity, diabetes, hypertension, and depression in adults. In children, it’s linked to increased rates of infection, hospitalizations, and poorer academic performance. 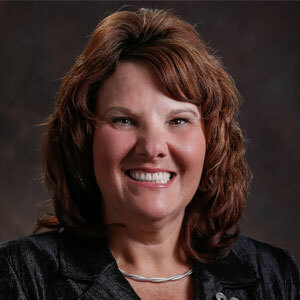 We worked with Atrium Health to change that – by increasing the availability of fresh fruit, vegetables, and other healthy foods in the areas that were most in need,” said Tina Postel, Loaves & Fishes, Executive Director. Atrium Health is not alone in its efforts to confront social barriers. Recently, NYU’s School of Medicine released a City Health Dashboard, which maps social determinants of health across 500 U.S. cities. Atrium Health takes these maps a step further, and connect patients to social services via our Community Resources Hub. Today we stand on the brink of a tremendous change in healthcare – with health providers growing increasingly aware of how social factors create the conditions for good health. Currently, Atrium Health is working to scale our approach across Atrium Health 900+ care locations. We’re also benchmarking the return on investment for this program, so that it can serve as a blueprint that other hospital systems can follow. As more and more hospitals shift to so-called “value-based care” (reimbursing based on outcomes, rather than services) they’re seeing that addressing social barriers can lower costs for patients and health systems alike. Other health providers would do well to use data on social factors to guide their community outreach and the health services they provide. I believe the piece that’s still missing is perhaps the simplest: talking to patients. Truly confronting social determinants of health requires that we start with asking them the right questions.